Metal detectors can be an invaluable tool in archaeological investigations. They are electromagnetic instruments and are capable of detecting and identifying metallic objects within the soil. This technique can be used prior to an archaeological investigation as part of a field assessment or in field walking. It can also be used as part of a recovery scheme within excavations and/or scanning unexcavated contexts and spoil heaps for metallic finds. 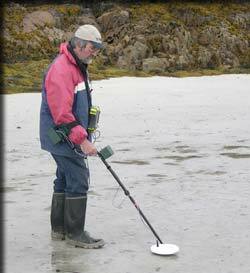 A metal detector can provide fast data collection with possible "hits' marked in the field and/or they can later be plotted on maps should the metal detector be used in conjunction with a Global Positioning System (GPS). The depth of investigation for individual objects such as nails and coins can be up to 30 cm with greater depths being achieved for larger objects. Tabulated A and plotted B accumulated metal detector "hits" in 2m x 2m survey squares showing archaeologically prospective areas along a trackway.